This is a liquid foundation, which comes with a pipet applicator. It is Formulated with Lychee, Bamboo Grass and Cordyceps Mushroom extracts. Now I am not a dermatologist but these ingredients work! My skin feels lovely! I have dry dehydrated skin and since using this foundation my skin looks dewy, radiant and I haven't had any breakouts. The foundation claims to have a powerful combination of serum ingredients which help to support the skin’s cellular energy and also offers key anti-aging benefits for a smoother, firmer, more lifted look. I wear the colour sand. You can see my full review here. This has to be one of my new favourite foundations. It leaves my skin looking flawless. It is slightly more coverage than I have been wearing over the last few months but it doesn't feel cakey or heavy on the skin. I bought the colour porcelain which is similar to Rimmel wake me up Ivory/Mac NW20/Nars Sante Fe in colour. This has to be one of the most popular foundations in the blogging world, but for good reason! This is one of my favourite foundations of all time. When worn if feels so light and velvety. It makes me feel like I'm hardly wearing anything on my skin. A 'your skin but better' feel. It lasts well and when I remove my makeup after a long day it is clearly visible on my makeup remover pad. Definitely worth a try if you like a light but buildable foundation with a dewy finish. I recently purchased the light wonder foundation from Selfridges after seeing it appear on many blogs. 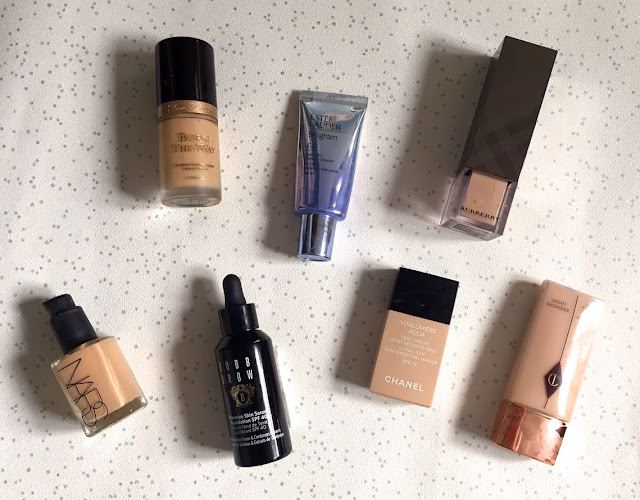 I think foundation has to be my favourite beauty product that I always like to try. Having dry skin makes it tricky sometimes to find a foundation that does not stick to dry patches or look cakey on the skin. I have had the Wonderglow primer and the airbrush flawless finish powder since Christmas so I thought it was about time to complete the trio. I have to say that I am impressed! The foundation has SPF 15 and is a light foundation that hydrates the skin without looking too thick. I really like this with the wonder glow primer underneath as it adds a lovely dewy finish that lasts really well. I use the powder just on my T zone to stop any shine. This is a very good, medium coverage foundation, which lasts well throughout the day. I bought a pump to go with this foundation as well as it is hard to dispense when just tipping out of the bottle (you end up wasting a lot too!) This is in between the Chanel vitalumiere and the double wear and has a similar finish to the Rimmel lasting finish foundation. Personally since having the Rimmel one, I have been reaching for that more during the winter as it lasts better and never clings to any dry patches. If you do not have very dry skin I think this would be a great one for you! Today I am going to be sharing my thoughts on the relatively new Burberry fresh glow foundation SPF 15. After watching Lily Pebbles recently I had to look what foundation she was wearing in the Youtube description box and discovered that this was it. I have recently fallen for the new Bobbi Brown intensive skin serum foundation SPF 40 (what a mouthful!) so I had to be impressed even more that usual. You can see a full review here. What is your favourite foundation? Next on my list to try is the Charlotte Tilbury magic foundation.